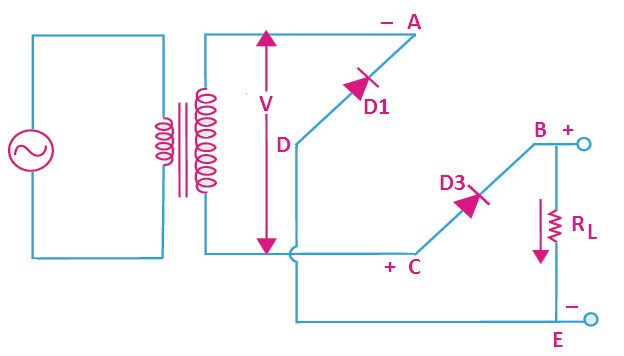 Hi friends, in this article, I am going to describe the half wave rectifier working principle and the full wave rectifier working principle, if you are interested, keep reading. Electric energy is available in homes and industries in the form of alternating voltage. But for the operation of most of the devices in electronic equipment, a DC voltage is required. Therefore almost all electronic equipment consists a circuit that converts AC voltage of mains supply into DC voltage. This part of the equipment is known as the power supply. The process of obtaining unidirectional currents and voltages from alternating currents and voltages is known as rectification. This function is performed by a circuit called rectifier circuit. The unidirectional conducting property of a diode finds great application in rectifier circuits. In this circuit, rectification is obtained by using a single diode, D, as shown in Fig. A transformer is used to change the voltage level of the mains supply. It also provides isolation from the power line and reduces the risk of electrical shock. When the circuit is connected to the power mains, an AC voltage is induced across the secondary of the transformer. It has alternate positive and negative half-cycles. no current flows through the load resistor RL. Thus, an alternating, sinusoidal waveform applied to the transformer primary is rectified into a unidirectional waveform. Obviously, the negative input half-cycle is suppressed i.e. it is not utilized for delivering power to the load. As seen, the output is not a steady dc but only a pulsating dc wave having a ripple frequency equal to that of the input voltage frequency. This wave can be observed by an oscilloscope connected across RL. When measured by a dc voltmeter, it will show some average positive value for voltage (approximately half of the input voltage). Since only one half-cycle of the input wave is used, it is called a half wave rectifier. Four diodes are used in a full bridge rectifier circuit, as shown in Fig. to obtain the output. The input is applied to two opposite corners and the output is taken from the remaining two corners of this circuit. During the positive input half-cycle, terminal A of the secondary is positive and C is negative as shown in Fig. To make the concept understandable, reverse-biased (OFF) diodes are omitted in Fig. current flows along ABEDC producing a drop across RL. During the negative input half-cycle, secondary terminal C becomes positive and A negative. circuit current flows along CBEDA. Hence, the current keeps flowing through load resistance RL in the same direction BE during both half-cycles of the ac input supply.Point B of the full bridge rectifier acts as an anode and point D as a cathode. The output voltage across RL is equal to the input voltage. Its frequency is twice that of the supply frequency. The pulsating outputs obtained from the half and full wave rectifier circuits are not suitable for the operation of electronic devices. To obtain a steady DC voltage, we have to filter or smooth out the AC variation from the rectified voltage. For this purpose generally, a capacitor, C, is connected across the output of the rectifier. This capacitor improves wave forms of the rectifier. When the rectifier output voltage is increasing, the capacitor charges to peak voltage Vm and when rectifier output voltage is decreasing capacitor starts to discharge through the load. This process continues. In this way, it smooths out the pulsations of a rectifier. How effectively a rectifier converts AC power into DC power is described by ripple factor and rectification efficiency. The ripple factor (r) is a measure of the purity of the DC output of a rectifier. It is 1.21 for half wave rectifier and 0.482 for full bridge rectifier. The rectification efficiency (ȵ) tells us what percentage of total input AC power is converted into useful DC output power. It is 40.6 % for half wave rectifier and 81.2% for full bridge rectifier. Thanks for reading about half wave rectifier working principle and full wave rectifier working principle. 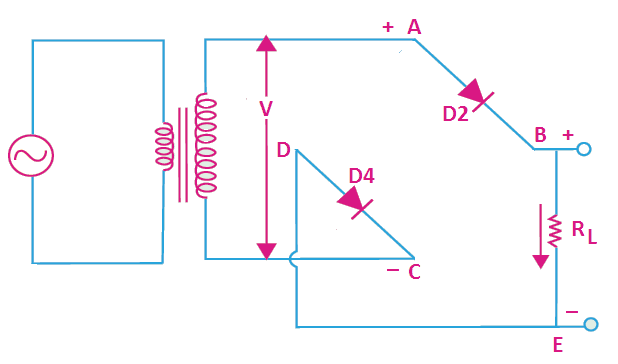 © https://yourelectricalguide.com/ half wave rectifier working principle and full wave rectifier working principle.